with the revised DPR estimates, the authority will be able to save about Rs 407 crore. Delhi, Metro Rail News: On March 19, 2019, The Delhi Metro Rail Corporation (DMRC) submitted a revised detailed project report (DPR) for further extensions of its Blue Line from Noida Sector 62 (Noida Electronic City to Mohan Nagar (Ghaziabad) under Phase-III project and Vaishali to Vasundhara Sector 2 under Phase IV. According to the detailed project report (DPR), the estimates cost of Noida Sector 62 to Mohan Nagar corridor stands at Rs 1,866 crore with six elevated stations while the cost of Vaishali to Vasundhara Sector 2 under phase 4 stand at Rs 1,866 crore. Phase 4 work will be started after completion of the phase 3 project. 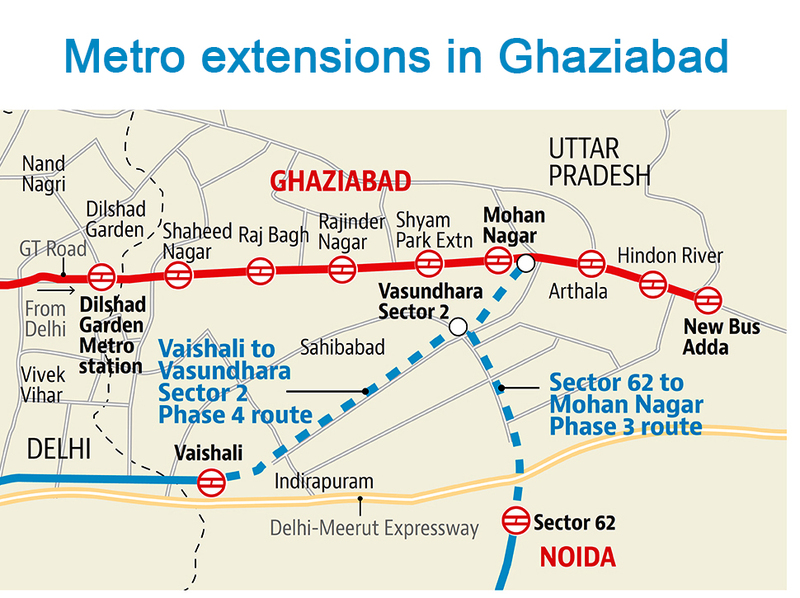 “DMRC has submitted a revised DPR of extensions of Blue line in Ghaziabad , A copy was also received by (Ghaziabad Development Authority) GDA. As per revised DPR, Sector 62-Sahibabad line will now be extended to Mohan Nagar, while Vaishali-Mohan Nagar corridor will be extended to Vasundhara Sector 2,” said Kanchan Verma, Vice-Chairperson of Ghaziabad Development Authority (GDA). In February 2018, the DMRC had submitted the first DPR for two extensions, from Noida Sector 62 to Sahibabad under phase 3 and Vaishali to Mohan Nagar under phase 4. After the detail discussion, the Ghaziabad Development Authority (GDA) decided to extend the line to Mohan Nagar and requested the DMRC to submit revised project reports for the two Metro extensions. “ The construction work of Vaishali to Vasundhara Sector 2 under phase 3 will be started first. The regional rapid transit system (RRTS) corridor will pass near the metro route at Sahibabad. Construction of a foot over the bridge of 150-200 metre possible to provide interchange facility between the two systems.” Verma added. Mohan Nagar Metro Station will also connect commuters to the 9.6km long Red Line extension that became operational on March 9. Whch runs between Shaheed Sthal (New Bus Adda) to Dilshad Garden. Both extensions of Blue line provide direct connectivity to commuters from Sahibabad, Vasundhara and Indirapuram to Noida and from Vasundhara, Sahibabad and even Vaishali to connect them directly to Central Delhi. Presently, Delhi Metro has two operational routes in Ghaziabad, Vaishali to Anand Vihar (phase 1) and Shaheed Sthal (New Bus Adda) to Dilshad Garden (phase 2). As per Feb 2018 DPR, the estimated completion cost of the phase 3 was pegged at Rs 1,926 crore, while the cost of phase 4 was stated at Rs 1,785 crore. Now, with the revised DPR estimates, the authority will be able to save about Rs 407 crore.